It's the simple pleasures in life that keep the glass half full: Saturday sleep-ins, spinning a new record for the first time, and a really, really, ridiculously good burger — the kind that gets your hands sticky and the button on your jeans pushing towards freedom. Who knew some of the best burgers in Brisbane are hiding out in the boondocks of Carina? Getta Burger is an espresso bar when you need that early morning pick-me-up and a burger shop when the clock chimes lunch, just like some kind of deliciously timely superhero. It's all smoke and no mirrors at Getta Burger, where the secret ingredient is meat. Because, as we all well know, you don't win friends with salad. 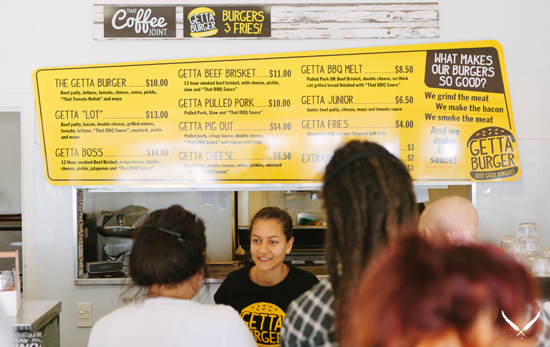 Getta Burger is the bricks-and-mortar complement to That BBQ Joint, one of Brisbane's favourite food trucks, which has been peddling Deep South smoky barbecue around town for around a year. Owner and meat maestro Brent Poulter says he wanted to create a food destination; somewhere people would eagerly flock to for their burger fix. So he did just that. 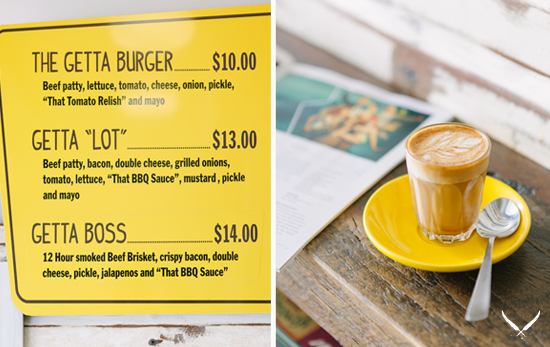 From Wednesday through Sunday, That Coffee Joint transforms into Getta Burger and every carnivorous Brisbanite comes crawling out of the woodwork, following the scent of slow-cooked brisket, pulled pork, and freshly minced beef patties sizzling on the griddle. Getta Burger is a pretty solid contender for Brisbane's worst vegetarian restaurant. So good are the eats here, there have even been marriage proposals extended to the burgers themselves. If deep emotional attachment to beef and buns is wrong, I don't want to be right. The 12-hour smoked Getta Brisket will fall apart in your mouth and lodge itself in your heart (in a good way). The gooey cheese, the crunchy pickles, the slather of slaw and lashings of That BBQ Sauce — it's mouth-wateringly good. There is no choice of 'panini or traditional' here. The burgers are one-size-fits-all, and that size is XL. There's nothing on the menu over $15, including what is perhaps the most intimidating burger of all: The Getta Pig Out. Get your oink on with pulled pork, crispy bacon, That BBQ Sauce, double cheese, topped with fries. That's right — fries on a burger. We've all done it, and Brent is validating our beautiful carb-on-carb fetish with this epic Brisbane burger. If you're a little shy on appetite, try a Getta BBQ Melt (the same delicious meats and sauce on thick-cut grilled bread, creating the ultimate toastie), a Getta Junior, or even the classic Getta Burger. On the side, the Getta Fries are seasoned with in-house smoked salt dust. Like I said, it's the simple pleasures. Even on a lazy Sunday, loyal fans of That BBQ Joint's meaty goodness make their way to Carina; a long line of orders hanging on the pass like a paper curtain. Judging by the crowds that gather to worship at the grill of Getta Burger, I wouldn't be surprised to see a horde of people chasing That BBQ Joint food truck down the streets of Milton — like an angry mob wielding $20 bills and delirious brisket-crazed expressions instead of pitchforks. While cafe culture can sometimes mean more style than substance, hole-in-the-wall Getta Burger is impressively substantial. We're pleased to say the good old-fashioned burger joint is alive and well in Carina. They grind the meat, they make the bacon, smoke the meat, they make the sauce — and they do a damn fine job of it. Click here for more of Brisbane's best burgers!